This “case” features the Giant Nudibranch (Dendronotus iris to 30 cm long) and the Tube-Dwelling Anemone (Pachycerianthus fimbriatus). The Giant Nudibranch’s favourite snack is this anemone species. It is not impacted by the anemone’s stinging cells (nematocysts). The Tube-Dwelling Anemone is therefore adapted to be able to withdraw into its tube in an attempt to get away from the predator sea slug. And the battle is on! The Giant Nudibranch patrols the sandy ocean plains “looking” for the Tube-Dwelling Anemone. When it finds one, it rears up and pounces, mouth parts extended in the hopes of grabbing onto the anemone. 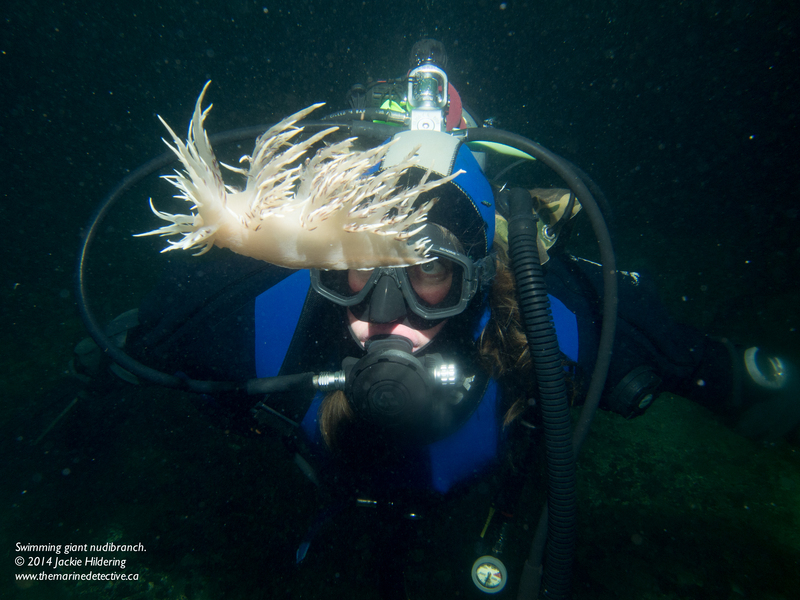 When the anemone senses the nudibranch’s attack, it withdraws into its tube. Wait till you see what happens to the Giant Nudibranch! See below for a short clip of such an attack. But that’s not all, this nudibranch species also swims. By lifting off, it may land somewhere with better chances for feeding and mating. See video below. As is also generally the way with sea slugs, they also lay their eggs on their prey. And oh the diversity in colour among Giant Nudibranchs. See photos below. Amazing and so beautiful – what an incredible world! I love that I can share our underwater world with someone whose art I so admire; who is able to create such beauty from the inspiration around her.